This man in his own country prayed we know not to what Powers. We pray Them to reward him for his bravery in ours. 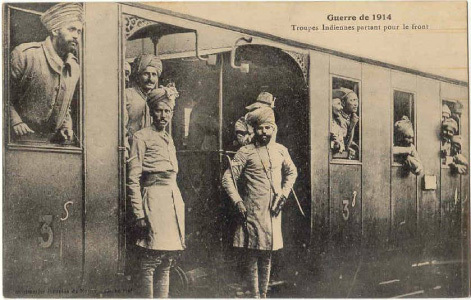 The Lahore Division of the Indian Corps arrived in Marseilles on 26th September 1914 at the same time as the French colonial forces from Africa. In Marseilles the Indians were given new rifles and warm clothing. 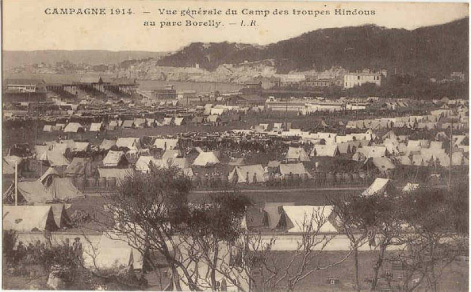 Four days later they left for Orleans, south-west of Paris, where they were to stay until 18th October and from where they entrained for the front. On arrival at the front the Lahore Division was split up. At that early stage in the war the front had not stabilised and there was fierce fighting to gain the most advantageous positions. The British were trying to stop the Germans taking the ridge that passed through the town of Messines in Belgium and the Lahore Division was involved in the desperate fighting in this area. This was part of a larger battle that became known as the First Battle of Ypres that ended officially on 11th November 1914. 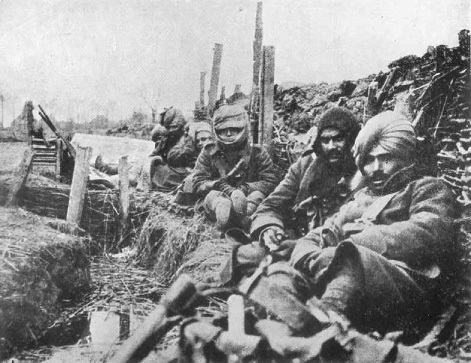 As the fighting at First Ypres died down the Indian Corps was allocated to its own sector of front line to the west and north-west of La Bassee in France. This was an area of low-lying, water-logged farmland and the Indian Corps were to stay here until November 1915. One of the Corps’ first actions in this area at the end of October 1914 was around the village of Neuve Chapelle. Although the Indian troops distinguished themselves by their bravery and determination and suffered heavy losses, as with so many battles in the First World War, their suffering was not rewarded by any significant progress on the ground. The village of Neuve Chapelle was to become the focus of a much larger British offensive in March 1915. At the beginning of 1915 it was decided to launch a major British offensive against the Germans. This was partly to support their Russian allies who had been staging vigorous and relatively successful offensives of their own on the Eastern Front, and partly to maintain the “offensive spirit” of the British troops. The British plans for this battle reflected their recent appreciation of the value of aerial reconnaissance and of artillery concentrations. This was the first large scale action in which the British had a predominance in both artillery and men. 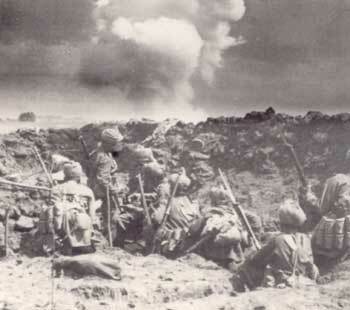 The orders for the attack were issued on 9th March with the Indian Corps assigned to the attack alongside the British 4th Corps. 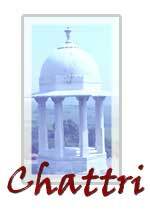 At that stage the Indian Corps strength was 11,682 of whom some 6,500 were Indian. Preparations for the attack included the construction of breastworks (lines of sand-bag defences above ground level), step ladders and screens, the bridging of streams and ditches, the creation of ammunition and equipment dumps and the preparation of artillery positions. 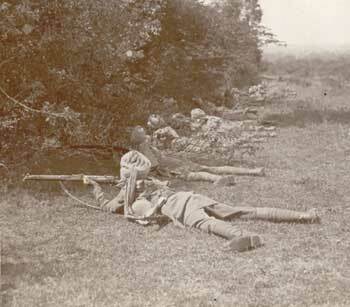 Early in the morning of 10th March some 480 British guns and howitzers opened fire on a front of just over two miles. 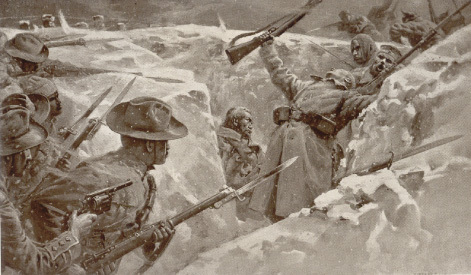 As soon as the guns lifted, troops from the Meerut Division started attacking the German front line trenches where they encountered little resistance and went on to take the village of Neuve Chapelle itself. During the attack Rifleman Gobar Sing Negi won a posthumous Victoria Cross for his gallantry. The subsequent phases of the battle were less successful. Delays in bringing up reserves and the rapid reinforcement of the Germans led to heavy casualties amongst the British and Indians. The battle closed after four days on 13th March although General Sir Douglas Haig officially suspended operations at 10pm on 12th March. 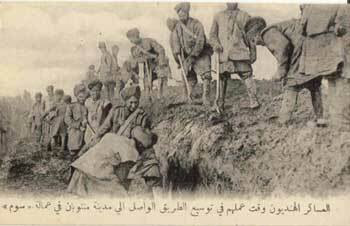 The total British losses including killed, wounded and missing, amounted to 12,811 of which nearly 2,200 were Indian. German losses were estimated to be even greater than the British. The total ground gained during the battle was a depth of 1,000 yards along a front two miles wide.